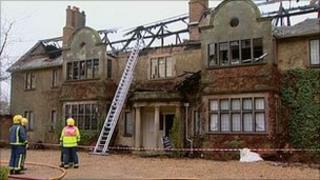 Forty firefighters have been tackling a fire at a Grade-II listed house in Warwickshire. Crews were called to the property in Banbury Road, Grays Mallory, near Bishops Tachbrook, at about 0500 GMT. No-one was hurt but about half the roof and first floor was damaged in the blaze which was under control by noon. Warwickshire Fire and Rescue Service said it was investigating the cause of the fire but it was not being treated as suspicious.